This is Pam Garrison's altered album. You can see her whole series of photos on her flickr from April 2006. isn't it wonderful?? 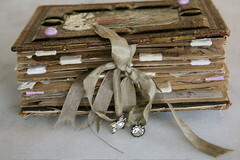 Wow lovely blog and perfect way to display your treasures.Thank You for sharing today!